Pork Katsudon is a Japanese rice topping with pork katsu, veggies and egg. 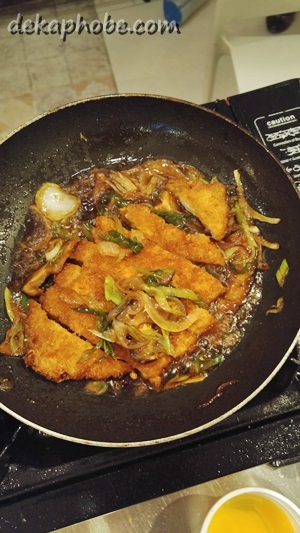 You may also use chicken breast fillet for Chicken Katsu instead of pork for this dish. 1. Pound the pork to flatten. 2. Season pork with Kikkoman Soy Sauce. Dip the pounded pork to flour, then egg, then breadcrumbs and set aside. 3. In a skillet, heat the oil and deep fry the breaded pork. Slice pork and set aside. 1. Break 2 eggs in a bowl. Mix the eggs, lightly breaking the egg yolks only. Set aside. 2. In another skillet, add oil and saute 1/2 of leeks, 1/2 of the onions and mushrooms. 3. Add 1/4 cup teriyaki sauce and the 1/2 dashi. Add sugar if needed. 4. Add 1 piece of Tonkatsu. 5. Pour the lightly mixed eggs on top of the breaded pork and cook for 1 minute. Cover the pan. Pour the cooked pork with the sauce over steamed Japanese rice. 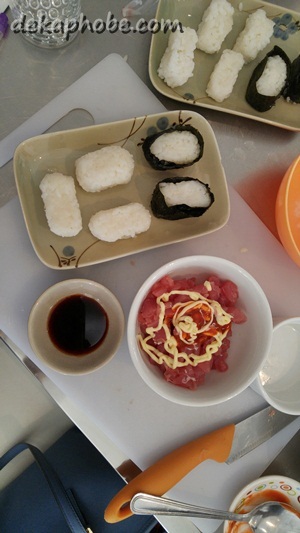 Garnish with sliced Nori. 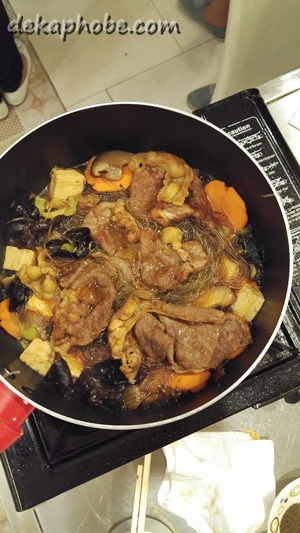 Beef Sukiyaki is a sweet and salty Japanese noodle dish. It is one of the most popular hotpot dishes as it is complete with meat and vegetables. 1. Mix beef and 2 tbsp of Kikkoman Soy Sauce. Saute by batch in 2-3 tbsp oil until brown. Set aside. Season tofu with 1 tbsp of Kikkoman Soy Sauce. Set aside. 2. In the same pan, saute onion, carrot, celery, and mushrooms. 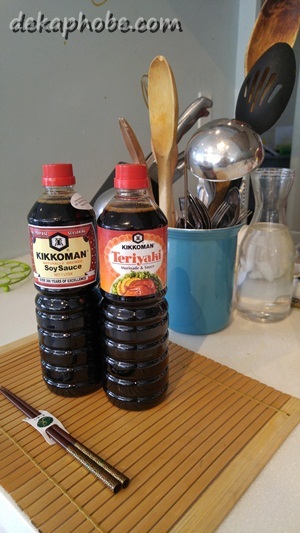 Add the remaining Kikkoman Soy Sauce, brown sugar then stir. Add broth including mushroom broth and 1/4 tsp pepper. Cover and simmer for 5 minutes. 3. Add tofu, sotanghon, and beef. Allow to simmer. Add cabbage and egg. Turn off heat. Top with leeks. Garnish with celery leaves. For dessert, we were served scoops of vanilla ice cream with drops of Kikkoman soy sauce. 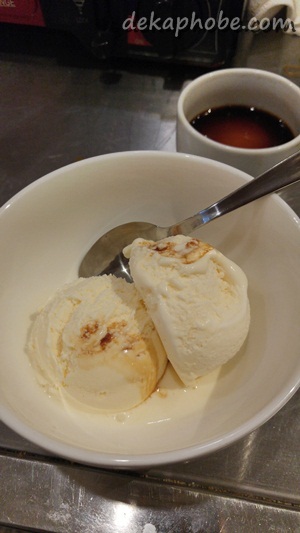 The saltiness of Kikkoman enhances the sweetness of the ice cream. In fact, I put more drops to my ice cream for it to taste a lot better. Thanks to Kikkoman Philippines for having us.